View from our hotel room in Hiroshima! We were ahead of schedule, so we took some time out of our day to enjoy Hiroshima a little bit and perhaps catch up on some work. 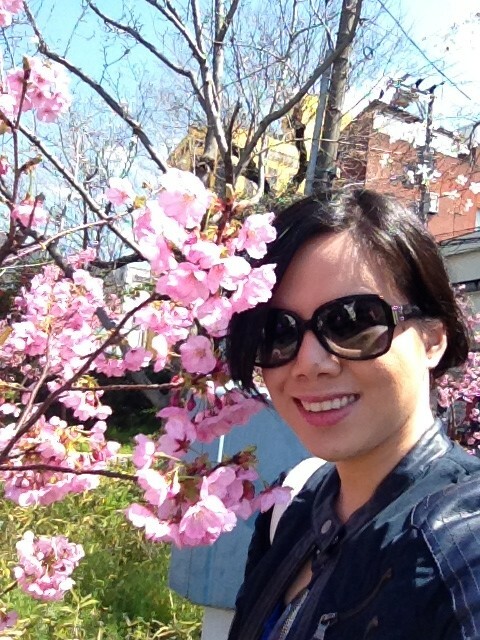 Spring was here and the Sakura trees were only a few days away from coming into full bloom. 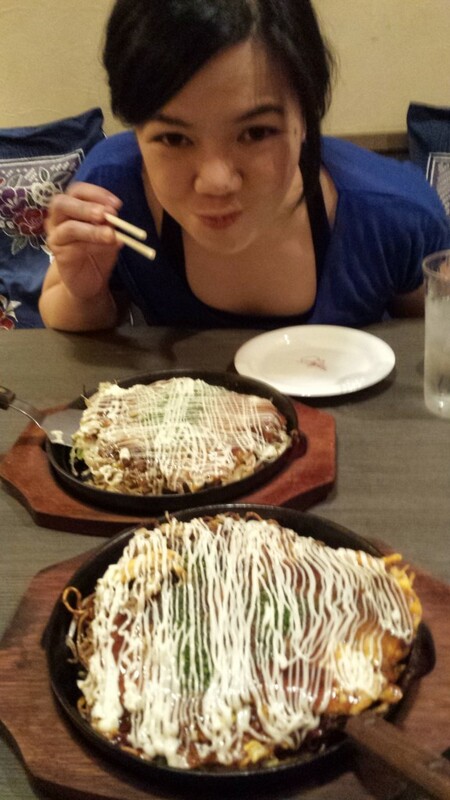 When in Hiroshima, you must try their okonomiyaki. This is their specialty and it is soooo good!!!! After lunch and a little shopping, we began our journey to Beppu Koi Farm. It seemed appropriate that Devin, Shawn and Ryan first visited Beppu Koi Farm in the Fall of last year because they all instantly fell in love with the place, and I was excited to discover why. Beppu Koi Farm is located on an island close to Hiroshima, reachable by train, boat or through a bridge by car. I was hesitant about taking a boat ride to the island, especially since I was prone to getting motion sickness, but I figured taking the most scenic and beautiful route would be worth risking the discomfort. It was. Upon entering the ferry, there was a sectional type couch built into the corner opposite the main cabin that was situated just below a large window. Devin pulled me to the side and said it would be nice to enjoy the view from there. 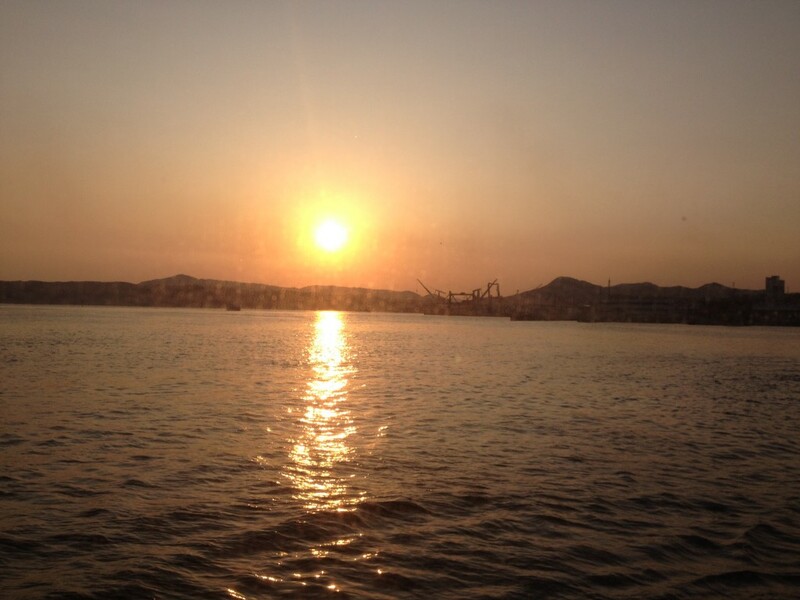 It was sunset when we pulled from the docks and I could not have imagined a better time to view the Hiroshima Coast line than against the different hues of the setting sun. A few minutes into the ride, I found myself needing to use the ladies room. Have you ever been to a Japanese restroom? There are enough buttons in there to rival a standard keyboard! Most of the time, there are little pictures to let you know what each button does (Bidet, bottom wash, bidet water temperature, water pressure, toilet seat temperature, small flush, big flush, background music while you do your business, etc…), but sometimes (like on a boat) there are only Japanese characters. Now the Japanese language has three alphabets; two of which I can read. Kanji is the alphabet that was taken from Chinese characters wherein each character has its own meaning. There are thousands of Kanji to learn and my knowledge of Kanji is limited somewhere along the lines of 25 characters. Not very impressive. After I use the toilet, I arrange my clothing then turn around to flush the toilet. uhm…. No pictures. No letters. No English translation. No Hiragana. No Katakana. Everything in Kanji. uh oh. Now theoretically I could have just gone ahead and pressed every button available, but then I would risk spraying water all over myself. Not happening. The toilets were separated for women and men, each one only allowing for a single person at a time to enter. I peek my head out the door and call Devin over. 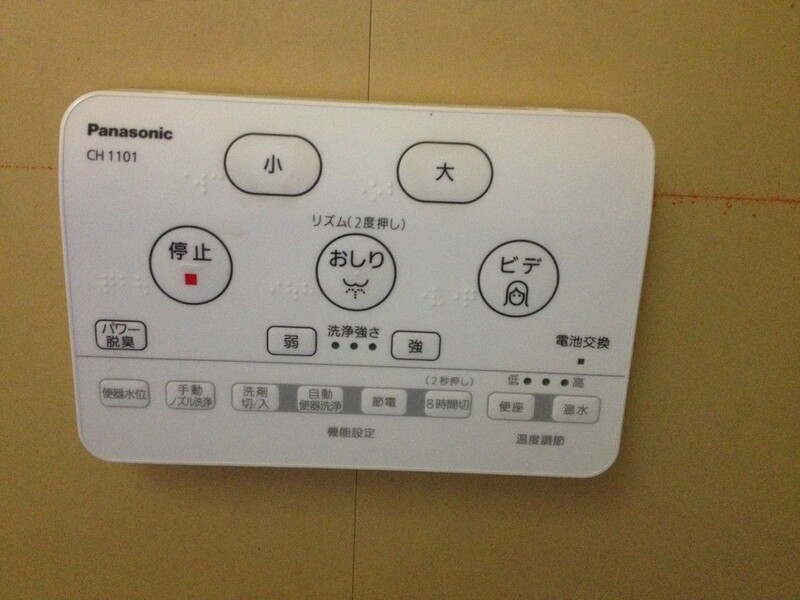 Standard Japanese Toilet “computer”. There are many more options typically available. Yes, there is a computer in the toilet. Devin turns red, but feeling sorry for me he comes in and helps me locate the button, which happened to be on the opposite side from where we were looking at. Great. What I didn’t realize when this whole conversation was going on was that there was an older lady waiting to use the restroom and she had witnessed Devin entering the ladies room with one foot out the door, pushing a button then hurriedly stepping out as soon as humanly possible. ops… hehehe…. I return to our couches embarrassed but laughing. After a while of “ooo’s” and “ahhh’s”, I was starting to feel light headed. Since the couch was situated just in front of the main boat engine, I thought it might be a good idea to get a little farther from the loud and consistent drone of machinery. We enter the main cabin where most of the other passengers were making themselves comfortable and I couldn’t help but admire measures the Japanese have taken to making sure that moving around their country was achieved in the best and easiest way possible. The interior of the ferry that we took is similar to that of the Shinkansen. There was an upper deck and lower deck lined with rows of very comfortable chairs that boasted at least two feet of space between each row (how I wish the airline industry would take a page out of the design for the Shinkansen interior!) The ceiling was recessed to take the glare out of direct lighting and three televisions screens were hanging in the front of the cabin, evenly spaced across the room. To the back of the room, a single cabin crew was stationed at a small snack bar where several Japanese snacks and drinks were being served. In here, the droning of the engine was nothing more than a whisper and I found myself immediately relieved of my discomfort. By the time we arrived, night had fallen over the quiet city of Matsuyama. Takaharu-san, who was the second son, had made arrangements for dinner so got into a taxi and headed to our hotel to drop off our bags and freshen up. Huh? What just happened? Apparently, Beppu is so well known at this hotel that his guests are asked for literally no more than their name! Devin just remembered that it was the same situation for them last time and he had forgotten about it. We head up to our room, call our parents to let them know we were still alive then head on down to the lobby where we found Takaharu-san waiting for us. This was the first time that I was meeting Takaharu san. I was already told that Takaharu resembles Kentaro Sakai in appearance quite a bit and could easily have been mistaken to be him under certain conditions. But while I might agree that they bear some similarities, in would take a few drinks to mistake him for Kentaro. What I found most impressive about Takaharu was the warmth and authenticity of his smile. So much so, in fact, that I have to dub it “Japan’s Best Smile”, to which Devin agreed. Prior to our arriving, Takaharu san had asked Devin what kind of food we were interested in eating and he mentioned that an Izakaya (traditional Japanese restaurant that serves alcohol as well) was probably best, especially since I love Japanese food. Since Matsuyama was situated on an island, naturally their specialty would be in fish and other seafood. The restaurant we arrive at was different than any I had ever been to in Japan. Upon entering, you are immediately greeted by the kitchen, which was surrounded by tanks stacked up against the wall and lined up against the walkway filled with various kinds of fish, oysters, clams and other live sea (soon-to-be) food. Through the kitchen we go to arrive at the main dining area. Originally designed in the traditional Japanese manner with solid dark wood interior, it seems the owners have continued the design based on their travels or various current interests. Various modern umbrellas hung from the wall and neon signs displaying various American brands lit up the walls. There were platforms of various heights all over the room with low, Japanese-style tables where customers were enjoying a different view of the restaurant. Underneath them, however, was the real gem. Giant tanks housing 3 sea turtles and several small fish were on display for everyone to enjoy. The largest of the sea turtles must have been at least four feet in length! Beppu-san explained to us that there were only a few places in Japan that had the license to keep these beautiful creatures in captivity, and since the restaurant was a private establishment, it was quite impressive that they kept their sea turtles in such a good environment. The server came around and we left it to Beppu san to order for us. I was, however, completely caught off-guard when the food did arrive. For the most part, I had managed to escape from eating some of the more exotic food that Japan has to offer. It was on this night that my streak came to a close. The meal started innocently enough: we were served an amazing dish of ground up fish meal packed into a fried cake that was quite delicious, which we consumed immediately. The next dish was a saba sashimi and when it came around, I struggled to control the volume of my yelp. Sitting atop a boat in it’s own sliced-up body was the head of the fish still alive and breathing! This is something I had heard about before and while both my father and Devin and experienced eating live sashimi, I never thought I would share that same encounter. Thankfully, none of the other parts were moving so after turning the serving boat in an angle wherein I couldn’t see the fish staring at me eating it up and mumbling “Gomen Nasai” apologetically, I proceeded to eat the sashimi. Normally saba is quite an oily fish, but if prepared correctly and served fresh from the sea, the oiliness of the fish is reduced to nothing and instead you get only the goodness of a well-prepared sashimi. Oysters were up next and even though oysters are not a dish I’m completely fond of, these ones were just divine. After that, the server came around with a plate filled with three large fresh clams. They were still alive and moving! I looked to Devin in fear. I was terrified. I had never eaten clams before, and the thought of having to consume something of that size terrified me. Whew. I love Japanese food and I have yet to refuse something that is offered to me to try in Japan, but eating raw clams is where I would draw the line I think. Thankful that I didn’t have to come up with some dumb excuse to escape that dish, I continue enjoying the rest of the meal. The clams arrived (thankfully) cooked and I was completely surprised by the taste. It was so good! The outer texture was a little tough, but flavorful, however it was the inner texture that completely blew me away. Resembling what I think to be scallops, it was extremely tender and with only a slight flavor of the sea. Yum! The typical Japanese-style of enjoying a night out usually involves a lot of moving around and transferring bars. After dinner, we hit up two more bars where we drink and talk before heading back to our hotel. MIkki – your blog is awesome! And very funny. Can’t wait to see you guys next week! I simply want to say I am new to weblog and actually loved this page. Likely I’m planning to bookmark your website . You really have outstanding articles. Regards for revealing your web site.